Climate change is happening. This we know. But how will climate change impact on truffle production and supply? In this article Dr Thomas discusses how the predicated changes in climate would impact Périgord truffle (Tuber melanosporum) production. The climate is changing. This we know. We have seen changes to climatic variables across the world, as evidenced from a large range sources, including climate station logging by humans. Future predictions for climate change are variable and complex. However, there is broad agreement for the direction of impacts for many areas. An interesting question then is ‘How will the predicated changes in climate impact Perigord truffle (Tuber melanosporum) production?’. As the majority of T. melanosporum are produced in Europe and the two biggest producers are France and Spain it is worth considering the potential changes in these regions in order to answer the questions. We know that in recent history, the climate of these two countries has observably changed and predictions for further change are discussed below. T. melanosporum is a temperature and precipitation sensitive species. The known temperature range of this species is displayed in Table 1. Table 1: Climatic data compiled from sites producing Tuber melanosporum fruiting bodies. The data incorporates sites in Africa, Asia, Europe, North America and South America (Thomas P., 2013). If we look at the present data for the two of the biggest truffle producing regions in both Spain and France, we can see that their temperature profiles fall well within the averages displayed in Table 1 (see Table 2). However, within just 35.7 years for Spain, the climate will fall outside of the known parameters for truffle fruiting. Although the time until these regions may be unsuitable is measured in decades, it’s important to note that these are averaged figures and that they mask variability and extreme climatic events, such as drought periods. This brief analysis also treats suitable summer and winter temperatures, individually. However, this is an overly simplistic view and accumulated temperature data may be of more use; as such, the summer and winter temperatures must be viewed in tandem. In this case, both regions in Spain and France may fall out-side of known productive parameters far sooner than the above predictions. The climate question is complex. However, we are teasing apart the data and hope to publish a full analysis later this year. To sum up, one thing is clear; Truffle producing regions in Europe are going to face significant challenges over the coming decades. With these challenges, production is likely to decline in some existing orchards. If we want to maintain annual supply, we need to explore new areas and increase cultivation in new territories, be they in Europe or beyond. 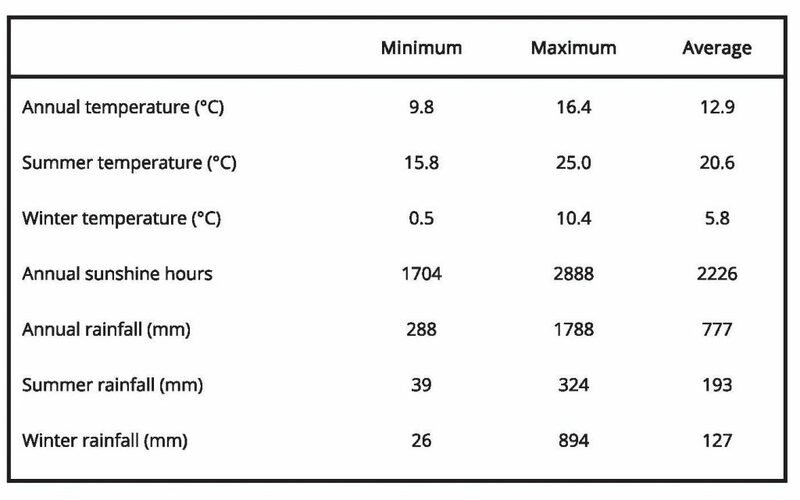 Thomas P. (2013) An analysis of the climatic parameters needed for Tuber melanosporum cultivation incorporating data from six continents. Mycosphere. 2014;5(1):137–142.